Two little boys were the best of friends. They played and laughed together for three years. It didn’t make any difference to them that one had darker skin than the other. All that mattered was that they enjoyed each other’s friendship. But – they lived in Atlanta in 1935. Soon their friendship was forced to terminate when they went off to separate public schools based on their skin color. They were no longer allowed to be friends. One of those little boys was Martin Luther King, Jr. Despite living under the Jim Crow laws, his parents taught him not to hate, but that his Christian duty was to love. His mother tried to instill in her son a sense of “somebodiness” – that we are all persons of importance – a lesson that was contradicted every time he exited the front door of their southern home. King understood that all people were created in the image of God (Genesis 1:26-27). He urged Americans to view each other the same way. “There is neither Jew nor Greek, there is neither bond nor free, there is neither male nor female: for ye are all one in Christ Jesus” (Galatians 3:28). As a reverend, King’s motivation was the Gospel, which he interweaved throughout his sermons at Dexter Avenue Baptist Church and public speeches. 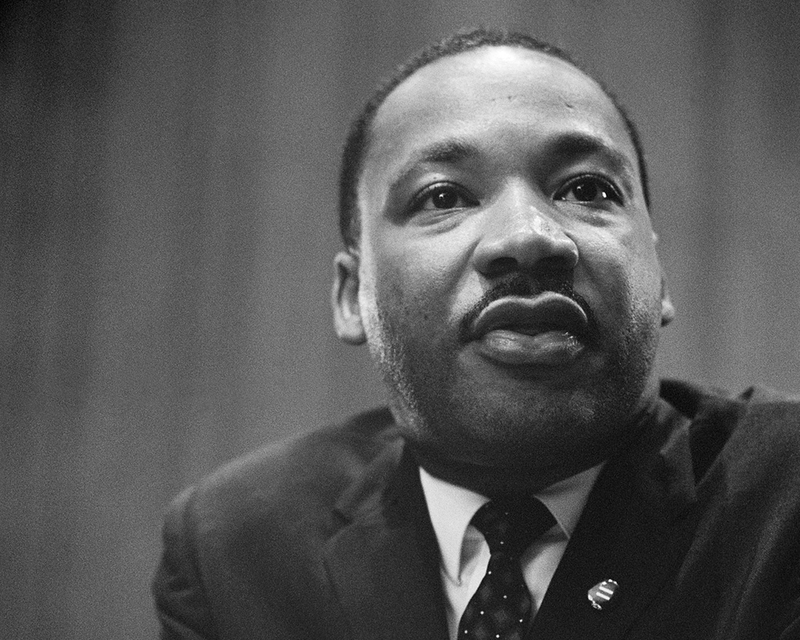 Inspired by evangelist Billy Graham’s crusades, King, along with several other civil rights activists, founded the Southern Christian Leadership Conference for the purpose of conducting nonviolent protests to achieve civil rights reform. He loved the Sermon on the Mount, and took seriously Jesus’ commands to “love your enemies” (Matthew 5:44) and “turn the other cheek” (Matthew 5:39). We’ve got some difficult days ahead. But it doesn’t matter to me now. Because I’ve been to the mountaintop. And I don’t mind. Like anybody, I would like to live a long life. Longevity has its place. But I’m not concerned about that now. I just want to do God’s will. And He’s allowed me to go up to the mountain. And I’ve looked over. And I’ve seen the promised land. I may not get there with you. But I want you to know tonight, that we, as a people, will get to the promised land. So I’m happy, tonight. I’m not worried about anything. I’m not fearing any man. Mine eyes have seen the glory of the coming of the Lord. May we also live lives so devoted to the Gospel that we accept God’s challenge in Matthew 5:44 to “…Love your enemies, bless them that curse you, do good to them that hate you, and pray for them which despitefully use you, and persecute you” in the same spirit of brotherly love as Martin Luther King, Jr. Tagged: God's Image, Martin Luther King Jr.